Following the Council of Delegates meeting in Boston, the World Federation of Neurology (WFN) trustees decided to invite Prof. Steve Lewis, Chicago, to act as a co-opted trustee. Lewis also chairs the WFN Education Committee. The Education Committee is therefore represented at the trustee level to inform and coordinate all educational activities. The nominating committee under the chairmanship of Prof. Marianne de Visser (Netherlands) will seek names of interested members of societies to be nominated for the two positions of treasurer and elected trustee. The elections will take place in Santiago during the 21st World Congress of Neurology. As stated in my last column, the COD approved the establishment of the new position of WFN treasurer. Over the summer, negotiations with Elsevier, our publisher, have continued. The proposal was to establish a spinoff open-access e-journal. This has been agreed and the journal shall be named eNS (eNeurological Sciences). The WFN is delighted that Prof. Bruce Ovbiagele, Medical University of South Carolina, has agreed to serve as editor, and the editorial board is being finalized. Open access e-journals are becoming ubiquitous, and ours will be operational during 2014. The contract for Journal of the Neurological Sciences is being finalized, and a new 10-year contract is expected to be signed by the end of 2014. This gives the WFN more scope in publications, being affiliated with two journals. The 2014 WFN grants have been agreed upon, and the recipients are being informed. We are grateful to the ILAE, WSO and the American Academy of Neurology for their support in partnering with the WFN in the awards. It is important to emphasize that the WFN Education Committee under the chairmanship of Lewis is monitoring the progress of all grants and some of the forthcoming grants reports will be submitted to the editor of World Neurology for his consideration. The budget for 2015 grants is already allocated, and the start of applications will be announced on the WFN website. Figure 2. 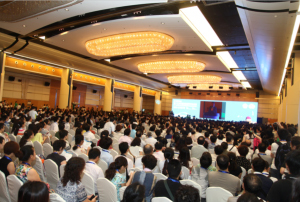 Chinese Neurological Society Audience in the main auditorium. Business meetings with Prof. Chuanqinag Pu, current president; Prof. Chuan Zhen Lu, past president; and Prof. Liylin Cui, president-elect were engaging and fruitful. (See Figure 3.) 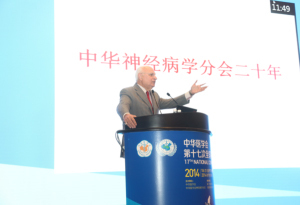 I am happy to report that there is initial agreement on introducing the CME program to China. This is most timely; as of 2015, the Chinese post-graduate neurology program is changing to a nationwide training curriculum to replace the current one, which is Hospital/University-based with varied curricula and outcomes. The matter is awaiting the final approval of the Chinese Medical Association. I had the opportunity to talk to many trainees who were eager to move to the new program. The WFN offered to help in every way possible in this massive endeavor across China. The WFN offer includes CME training programs appraisal as well as course evaluations and, if needed, accreditation. Our Chinese colleagues were keen on international recognition of their new training program, and I am sure that regional organizations across the world will be happy and willing to help and advise. Figure 3. 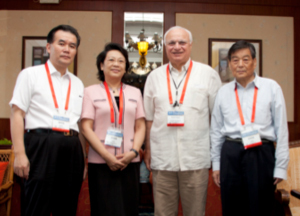 From left to right: Prof. Chuanqiag Pu, CSN president, Prof. Liying Cui, president-elect CSN, Raad Shakir, president WFN, and Prof. Chuan Zhen Lu, past president CSN. From the first, to the second most populous country on earth. I have been asked to participate in the annual Indian Academy of Neurology meeting in Chandigarh Nov. 6-9, 2014. This gives the WFN the opportunity to see how our Indian colleagues are progressing with their neurological training, research and care provision. India is the No. 1 user of the WFN-administered CME program. The leader is Prof. Sarosh Katrak (Mumbai) and the latest six monthly figures continue to show excellent utilization. This is one of the best examples of interregional collaborations. 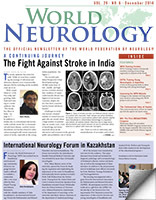 The American Academy of Neurology donates the program to the WFN, which administers and distributes the material across the world. The Indian Academy of Neurology is planning a four-day congress with a varied and most interesting program. The scope is huge with teaching courses, guest lectures, pearls in neurology, neuroradiology rounds, video sessions, debates, clinical-pathological cases and a session titled, “My Most Interesting Case.” Faculty from all parts of India and from across the world participate. With China and India, the two largest populations in the world are moving full steam ahead with their neurology training and research. The close collaboration with the WFN only strengthens the relationship and brings together a large number of neurologists. The future of neurology in both countries is assured. The preparations for the World Congress in Santiago are progressing extremely well. The scientific program and the teaching courses are complete. The variety is most impressive. I have to register the WFN gratitude to Professor Renato Verdugo, president of the congress and all our Chilean colleagues as well as Prof. Donna Bergen, chair of the WFN Scientific Program Committee for their hard work and perseverance. The result is impressive. Chile is an amazing and welcoming country, and we all look forward to seeing many neurologists from across the world. The preparations for Kyoto 2017 are well under way. The Japanese Neurological Society in collaboration with the Asian Oceanian Association of Neurology (AOAN) is moving ahead with the formation of all committees. The WFN Scientific Program Committee is led by Prof. Werner Poewe (Austria), and the local Scientific Program Committee is chaired by Prof. Yoshikazu Ugawa. The WFN Congress Committee is in the process of assessing possible sites for the WCN 2019. Its report will be available well before voting takes place during the Council of Delegates meeting in Santiago on Nov. 1, 2015. Events have moved on rapidly during this year. Two of the six WFN regions have seen major changes; in Europe with the birth of the European Academy of Neurology (EAN); and in Latin America with the impending incorporation of the Pan American Federation of Neurological Societies (PAFNS). The Asian Oceanian Association of Neurology is consolidating its membership and activities and is involved in the preparations for WCN 2017 in Kyoto. The Pan Arab Union of Neurological Societies (PAUNS) is holding its next biennial meeting in January 2015 and is planning a major change in its constitution and operational activities. The Pan African Association of Neurosciences (PAANS) is in the process of redefining its membership and coming up with a neurology-only organization, as African Neurosurgeons have gone their own way being part of our sister organization the World Federation of Neurosurgical Societies (WFNS). The proposed name for the new organization is under discussion but the African Academy of Neurology is a likely contender. The North American region continues its most valuable support for all other regions in providing education, CME as well as financial support for activities in the developing world. All of these activities bode well for the WFN in 2015. We are all excited by the prospect of our second World Congress in South America, and I am sure that I speak on behalf of the WFN trustees and administration in wishing neurologists and their families across the world a happy, healthy and productive 2015.